Utilizing 5 hp motor, 90Â° Upender positions loads for assembly and palletizing operations. Platform sizes range from 48 x 54 in. to 60 x 72 in. with capacities from 2,000-10,000 lb. Steel coils and paper rolls can be put on unit with core parallel to ground. 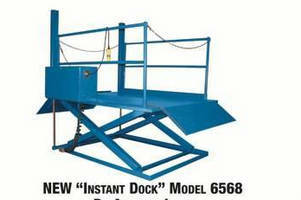 Upender then rotates 90Â° onto pallet with core perpendicular to ground, permitting safe transportation of coil or roll. System includes built-in power unit and chrome-plated axles, shafts, and cylinder rods. Advance Lifts, Inc. of St. Charles, Illinois has a complete line of 90-degree upenders to safely and efficiently position loads for assembly and palletizing operations. 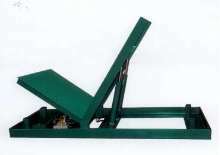 Steel coils and paper rolls can be put on the unit with their core parallel to the ground. The unit is then rotated 90 degrees onto a pallet with the core perpendicular to the ground, which permits safer transportation of the coil or roll. 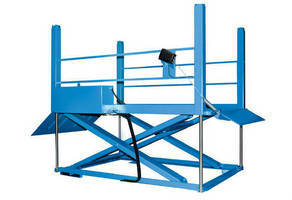 The upenders have capacities from 2000 to 10000 lbs., and platform sizes from 48" x 54" up to 60" x 72". The upenders operate off a 5HP motor, have UL approved electrical assemblies, a built in power unit and chrome plated axles, shafts and cylinder rods. Custom sizes are also available. Advance Lifts, Inc. manufacturers loading dock equipment, work positioners, lift tables, recycling equipment and packaging equipment. 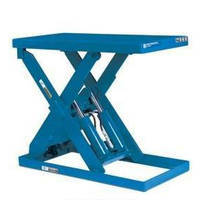 Material Handling Lifts handle up to 6,000 lb loads. 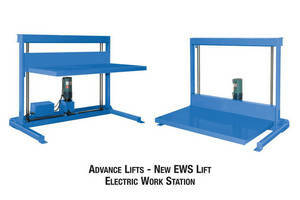 Electric Lift features quiet, energy efficient operation.